Streetfront volunteered for the 4th straight year with MoreSports annual “Splash and Dash” duathalon. Kris and Christine have been promoting healthy lifestyles through their love of multi-sport events for years. Their “Splash and Dash” series of duathalons targets East Van elementary schools that are in the catchment of Britannia Secondary. 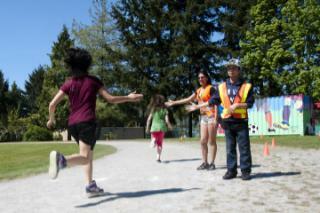 Over 170 students from Strathcona, Seymour and Britannia Elementary participated in this year’s event. The Streetfront kids are always excited to help out when they can, especially when it involves kids. The students volunteer jobs ranged from”rabbits” and “turtles” (rabbits get the 1st kids out of the pool, while the Turtles help bring up the back of the pack); to runner escorts; to finish line attendants; to Britannia Bruin mascot duties. We couldn’t be more proud of the efforts of our kids. They always make Streetfront look good. 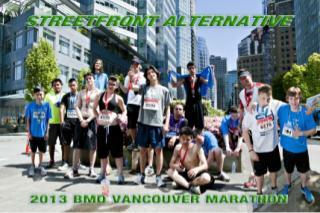 14 current and former Streetfront students headed out into the sunshine on Sunday May 5, to run the Vancouver Half or Full Marathon. The stories are incredible. These kids face so much adversity but they put their heads down and just pound the pavement. No whining, no excuses, just determination. Segar Florence; Josue Cinceneros: Lukas Bezanson; Liam Dunn; Zach Lattie; Johnson Wilson; Jesse Costucci-Phillips; Willy Dugray; Shwana Bestoun; Kyle Leo; Jordan Braun; Raymond King; Joseph Malley and Matthew Morin for showing once again what youth can do.